With the odd sizes and shapes of mattresses on boats, finding yacht bedding and custom v berth mattresses can be a chore. Look no more! 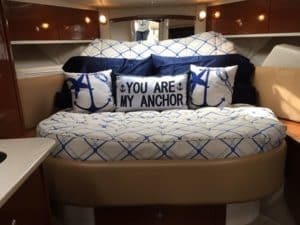 YachtBedding.com has many new and retired Sea ray patterns on file and can make the process of buying custom boat bedding very easy. We offer a great selection of fabrics for custom boat linens as well as different options for custom boat sheets. Our 600 thread count cotton sheet sets are a best seller. Not only are they extremely comfortable and wash up beautifully, but they are made to fit the crazy shape of your unique mattress. A custom made bedspread looks great and also provides protection for your mattress and sheets since boat beds are often used for storing items when not in use. Take a look at our best selling bedding packages to get an idea on fabrics. Our pricing structure makes it very easy to get accurate pricing for the items you need. Contact us with any questions, we are happy to help!